Nationality: American. Born: Terence Steven McQueen in Slater, Missouri (or Indianapolis, Indiana), 24 March 1930. Military Service: Marine Corps, 1947–50. Family: Married 1) the actress Neile Adams, 1956 (divorced), children: Terry Leslie and Chadwick Steven; 2) the actress Ali McGraw, 1973 (divorced). Career: Abandoned by father while an infant; spent part of childhood at Boys' Republic, Chino, California, a reform school; 1950—worked at various jobs, lumberjack, sailor, oil field worker; 1952—began studying at Uta Hagen-Herbert Berghof School of Acting, New York; stage debut in walk-on role in a Second Avenue Yiddish theater; early 1950s—appeared in summer stock and on TV; 1956—film debut in bit role in Somebody Up There Likes Me ; replaced Ben Gazzara on Broadway in A Hatful of Rain ; 1957—first featured film role in Never Love a Stranger ; 1958–61—in TV series Wanted: Dead or Alive ; early 1960s—formed production company Socar; 1969—co-founder, First Artists Production Company. Died: Of cancer at clinic Santa Rosa in Juarez, Mexico, 7 November 1980. Campbell, Joan, The Films of Steve McQueen , Farncombe, Surrey, 1977. Ferrari, Philippe, Steve McQueen , Paris, 1981. Satchell, Tim, Steve McQueen , London, 1981. Ragsdale, Grady, Steve McQueen, the Final Chapter , Ventura, California, 1983. Durant, Philippe, Steve McQueen , Paris, 1984. Nolan, William F., McQueen , New York, 1984. St. Charnez, Casey, The Films of Steve McQueen , Secaucus, New Jersey, 1984. Kirberg, Robert J., Steve McQueen: seine Filme, sein Leben , Munich, 1985. Spiegel, Penina, McQueen: The Untold Story of a Bad Boy in Hollywood , Garden City, New York, 1986. Toffel, Neile McQueen, My Husband, My Friend , New York, 1986. Guerif, Françoise, Steve McQueen , Paris, 1988. McGraw, Ali, Moving Pictures: An Autobiography , London, 1991. Terrill, Marshall, Steve McQueen: Portrait of an American Rebel , New York, 1994. Keyser, Michael, A French Kiss with Death: Steve McQueen & the Making of Le Mans : The Man—The Race—The Cars—The Movie , Cambridge, 1999. Storr, Robert, Steve McQueen , Phoenix, 1999. Harper's Bazaar (New York), February 1965. Obituary in New York Times , 8 November 1980. Obituary in Newsweek , 29 December 1980. Eyman, S., and D. Elley, "The Under-Achiever: The Outsider," in Focus on Film (London), March 1981. Cieutat, Michel, "Steve McQueen, ou les limites de la nouvelle frontière," in Positif (Paris), June 1981. Beaver, J., "Steve McQueen," in Films in Review (New York), August/September 1981. On TV work in Films in Review (New York), February 1982. Sragow, Michael, "The Films of Steve McQueen," in Video Movies (Skokie, Illinois), May 1984. Cohen, Meg, "McQueen of Hearts," in Harper's Bazaar (New York), February 1993. Champlin, Charles, "Steve McQueen: A Brentwood Retreat Suited to the Dynamic Star," in Architectural Digest (Los Angeles), April 1994. Pascaud, Fabienne, "Le baroudeur solitaire," in Télérama (Paris), 21 September 1994. Péguillan, Frédéric, in Télérama (Paris), 13 September 1995. Norman, Barry, "How McQueen Turned a Lemon Into Gold," in Radio Times (London), 8 February 1997. Stories of Steve McQueen's troubled childhood and roustabout adolescence never squared with the fastidiousness of his screen persona, the aristocracy of his best roles. McQueen did not need to act snobbery and elitism; his whole being vibrated with a sense of natural superiority. Only once, in The Thomas Crown Affair , did he play the wealthy and powerful man he was in real life, and then the role fitted him as perfectly as his tailoring. 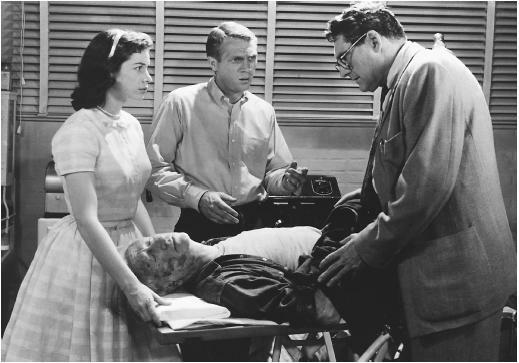 Even as early as his 1958 role in a cheap sci-fi feature, The Blob , it was possible to see something different about Steve McQueen. This actor could play people who instigated events rather than simply responded to them. Undeterred by civic disbelief and police disapproval, he almost single-handedly rouses the town to the menace from outer space, even emptying the local cinema one step ahead of the flood of red jelly. His Vin in The Magnificent Seven is one of the great roles of Western cinema, an intricate portrait of youthful professionalism which may draw on McQueen's early days as a student actor in New York. It is not the callow Horst Buchholz but McQueen who is the real tyro of the group. A Hemingway hero, his experience of life has not caught up with his expertise, and for much of the film he is concerned to define himself by the standards of the job he has been given. The other gunmen either sympathize with the Mexicans or are antagonistic; only McQueen is indifferent to them. But he is enough of a romantic to wonder at the absence of women, and when a cache of them is discovered, hidden by anxious relatives, his response is a touching solicitude. As Buchholz unceremoniously heaves Rosenda Monteros over his saddle McQueen murmurs, "Gently, boy . . . gently." Repressed loners in search of standards were McQueen's speciality. His wintry blue eyes, neat movements, and clipped unemotional voice told you everything you needed to know about life on the road, in the trenches, in prison, or on the trail. He did not mind being unsympathetic; audiences knew he was a cut above those around him, and identified with his locked-tongue loneliness, his private obsession—something Peckinpah explored (and exploited) to great effect in The Getaway . The best McQueens are in the 1960s. His ambitious young professional gambler in The Cincinnati Kid , psychopathic World War II G.I. in Hell Is for Heroes , World War II pilot in The War Lover , itinerant jazz musician in Love with the Proper Stranger , and rootless wanderer in Baby the Rain Must Fall all flirt with villainy, particularly in their callous attitude toward the women who love these driven men. His Frank Bullitt in Bullitt is no better, but when, in the final enigmatic scene, he returns to his apartment after the bloody airport shootout, sees his mistress sleeping, and impassively washes his hands before joining her, the line between hero and clod is decisively drawn. Yearning for critical respectability as a versatile actor, not just a film star, McQueen grew a beard and took on the change-of-pace role of the whistleblowing title character who earns the enmity of the society he is trying to protect in an ambitious film version of Ibsen's The Enemy of the People , financed by his own company. No one but McQueen, it seemed, believed the arty film had a chance of finding an audience, and it was never released to theaters; it languished on the shelf for several years before being shuttled to television. McQueen bounced back in a pair of films more in harmony with his traditional image, the Western Tom Horn (ironically a sort of cowboy variation on The Enemy of the People ) and the action film The Hunter , in which he played a real-life tracker of crooks who jump bail. Horn was a flop but The Hunter proved the commercial shot in the arm the actor needed to maintain his star status. Unfortunately, he had earlier been diagnosed with cancer and spent the last months of his life seeking miracle cures in Mexico and elsewhere before succumbing to the disease at the young age of 50. McQueen was married to Barbara Minty (a model) in 1980. He also made his last film in 1980 -- The Hunter. Both of these facts are absent from your article. What a guy. Brilliant man! Very underrated...an icon of the screen.